Daimler AG has approved an expenditure of more than $2 billion for upgrading and expanding operations at its U.S. auto assembly plant near Tuscaloosa, Alabama. The new spending will pay for the plant to begin building the Mercedes-Benz C class car, as previously announced, and also to retool for new generations of two of the plant's existing models, the Mercedes-Benz R-class crossover and G-class SUV. The investment comes as Mercedes battles German rival BMW for the title of best-selling luxury brand in the United States, following an 11-year reign by Toyota's Lexus. In a statement released Thursday, Daimler did not say what time period the investments will cover or what other future projects they might fund. The plant will launch C-class production in 2014, Daimler said in late 2009. The company revealed the investment figure today following a Job 1 plant celebration yesterday that kicked off production of the new-generation Mercedes M class there. The Tuscaloosa plant opened in February 1997 as a modest $350 million manufacturing investment to put Mercedes-Benz retailers into what was then a booming SUV market with the M class. At that time, the plant was viewed as something of a risky roll of the dice. Mercedes had never operated a factory outside Germany, never trained an inexperienced work force, never worked with U.S. automotive managers and never sold an SUV in the United States. Even as the Tuscaloosa plant prepared for launch in 1997, Mercedes executives asked members of the media whether they thought the plant would succeed. Among those executives was Dieter Zetsche, now chairman of Daimler and head of Mercedes' car operations globally. 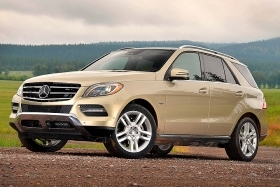 Since then, Mercedes has expanded the Tuscaloosa plant repeatedly, although production levels collapsed after the SUV market began deflating in 2008. Zetsche told workers at the plant that Tuscaloosa is Daimler's "pioneering plant," according to the statement issued on Thursday. Zetsche said: "It is also the blueprint for our new operations in emerging markets. "We're continuing to write new chapters of the plant's success story with significant investments into the future," he was quoted as saying. Through June, BMW sold 113,705 of its namesake vehicles in the United States. Mercedes, not counting its Sprinter commercial vans, had 110,926 sales. Lexus, hampered by the March earthquake in Japan, tallied 88,010 sales.